Be nice to your face by washing it with a nice, soft cloth made from your favorite cotton yarn. Crochet gives the cloth a nice texture, and bright colors are a feast for tired eyes in the morning. Just add your favorite cleanser and you’ll be ready to start your day off or head to bed with a fresh, clean face. 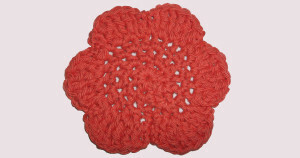 This entry was posted on Saturday, July 4th, 2015 at 12:00 AM by Candace	and is filed under Free Crochet Patterns. You can follow any responses to this entry through the RSS 2.0 feed. You can skip to the end and leave a response. Pinging is currently not allowed. Wondering how to make an adjustable ring at the start? Thank you. Thank you so much You are my crochet Angel. Got tired of just giving gift certificates to my young people now I have a little extra to put in, thank you.